Bohemian rabbi; born in the latter part of the fifteenth century; died at Prague, Oct. 7, 1542. For the last twenty years of his life he was rabbi of Prague, and as such had many pupils, among whom was Abraham Jaffe,father of Mordecai Jaffe. Abraham wrote glosses on the "Ṭur Oraḥ Ḥayyim" of R. Jacob b. Asher, some of which were published at Augsburg in the year 1540. They are characterized by clearness and vigor, and are mainly restricted to simple verbal explanations, in opposition to the more elaborate system of the pilpul, which was then coming into use in the schools of Poland and Germany. 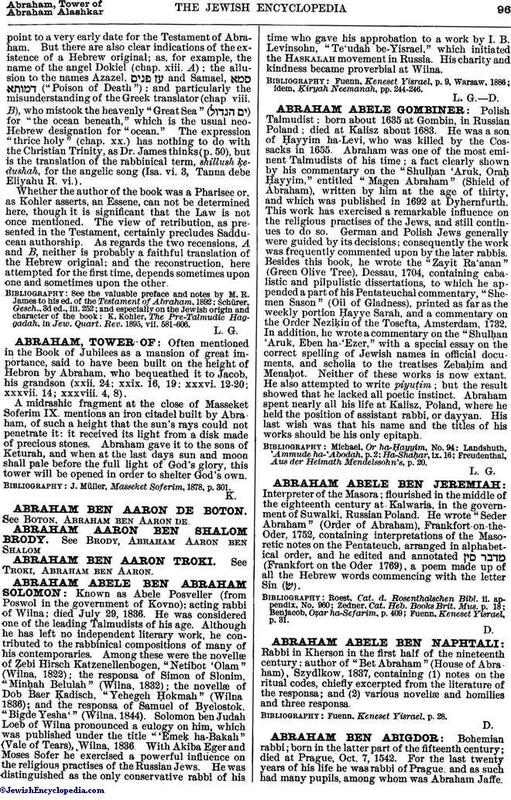 Abraham was trained in secular learning, and legend ascribes to him a knowledge of the "seven sciences." 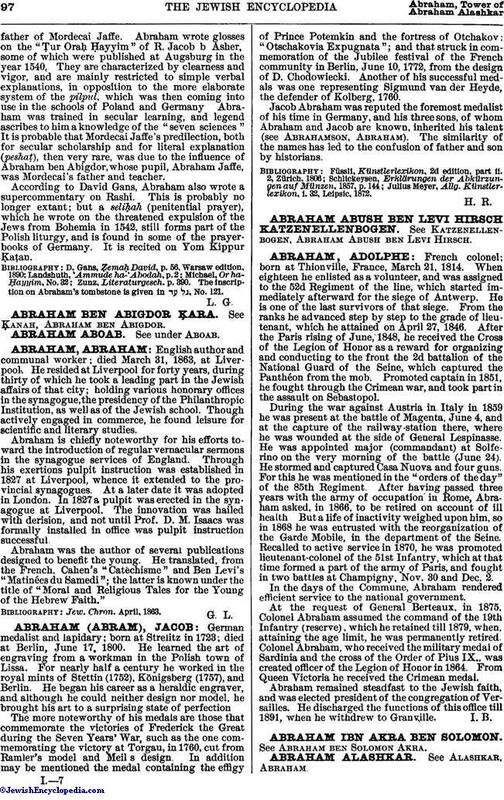 It is probable that Mordecai Jaffe's predilection, both for secular scholarship and for literal explanation (peshaṭ), then very rare, was due to the influence of Abraham ben Abigdor, whose pupil, Abraham Jaffe, was Mordecai's father and teacher. According to David Gans, Abraham also wrote a supercommentary on Rashi. This is probably no longer extant; but a seliḥah (penitential prayer), which he wrote on the threatened expulsion of the Jews from Bohemia in 1542, still forms part of the Polish liturgy, and is found in some of the prayer-books of Germany. It is recited on Yom Kippur Ḳaṭan. Zunz, Literaturgesch. p. 390. The inscription on Abraham's tombstone is given in , No. 121.